A record 101 books are in contention for Sisters in Crime Australia’s 18th Davitt Awards for best crime books by Australian women. This figure tops last year’s record by two. An astonishing 71 are adult crime novels and more than a third – 37 books in total – are debut offerings. Davitt judges’ wrangler, Jacqui Horwood, said more and more women authors were getting away with murder in the most creative ways. “Some victims get pushed into craters. Others appear washed up on the shores of lakes in country towns or fail to return from executive team-building exercises in the mountains. In one case, it’s the story of the death of a haunted town thanks to the pervasiveness of asbestos,” she said. Horwood said that scenes of the crimes were equally varied. Horwood said that women’s crime writing had skyrocketed over the last 18 years. “Back in 2001 when the Davitts were launched at SheKilda, Sisters in Crime’s 10th anniversary convention, only seven books were in contention, though it’s true that non-fiction crime books weren’t then included. Nevertheless, a fifteen-fold increase in 18 years bears witness to just how women’s crime writing continues to hit – and exceed – its mark,” she said. Australian women crime writing was winning global acclaim, Horwood said. “Last year, Liane Moriarty, the 2015 best adult novel winner, was twice invited onto the stage by Nicole Kidman when she won major acting awards for the TV series based on Big Little Lies (Pan Macmillan Australia),” she said. “Reese Witherspoon, who co-produced and co-starred in the series with Kidman, is filming The Dry (HarperCollins Australia), Jane Harper’s novel which won two Davitts last year (Best Adult Crime Novel and Readers’ Choice). The Dry also took out the UK Crime Writers’ Association Gold Dagger. Emma Viskic’s Resurrection Bay, which won an unprecedented three Davitts in 2106, has just been longlisted in two categories for this year’s Daggers. Horwood said she was particularly gratified to note that four winners from Sisters in Crime’s Scarlet Stiletto short story competition had novels in contention – Ellie Marney, Lois Murphy, Anna Snoekstra and M J Tija. “One of Sisters in Crime’s missions is to discover and nurture talent of the criminal kind. Twenty-three Scarlet Stiletto winners, including category winners, have gone on to have novels published over the last 25 years and this year’s Davitts again prove the point,” she said. This year, for the first time, Sisters in Crime accepted self-published books. “Seismic shifts have rocked the publishing world over the past decade. Large numbers of writers are choosing to publish their own works, either because they can’t find a trade publisher or because these days, they can release their own books for a modest cost and earn up to 70% of the sale price. “Book publishing has also undergone a revolution, sparked by advances in internet and digital technology. This revolution is as disruptive as the Gutenberg press, flooding the world with millions of POD paperbacks and cheap e-books available from Amazon and other outlets,” Horwood said. “Literary awards, including awards as prestigious as the Victorian and NSW Premier’s Literary Awards, the Commonwealth Book Prize in Australia, and the Irish National Book Prize and the UK Folio Prize overseas, now accept self-published books. Self-published books can no longer just be dismissed as vanity publishing. Danish crime writer Sissel-Jo Gazan will present the Davitt Awards at a gala ceremony in Melbourne at 6pm on Saturday 11 August, following a discussion about her life in crime with author Leigh Redhead. 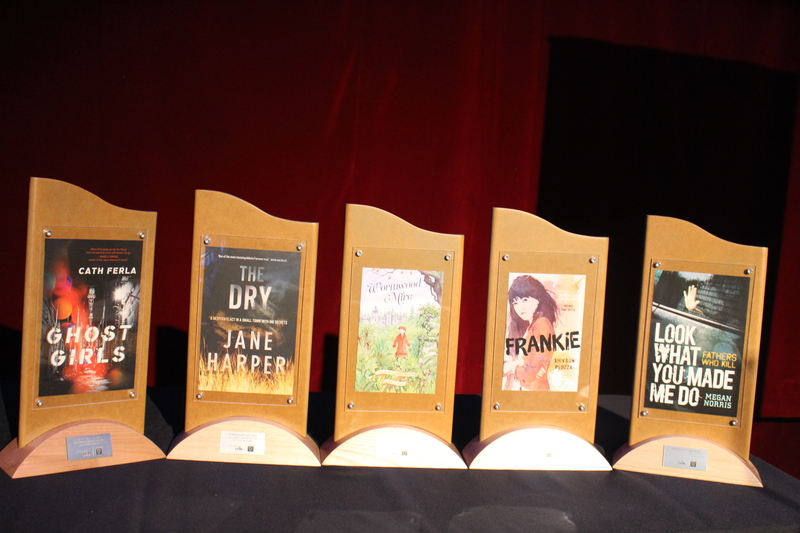 Gazan will present six awards: Best Adult Crime Novel; Best Young Adult Crime Novel; Best Children’s Crime Novel; Best Non-fiction Crime Book; Best Debut Book (any category); and Readers’ Choice (as voted by the 500 members of Sisters in Crime Australia). Bookings open on 9 July. The Davitts are named after Ellen Davitt, author of Australia’s first mystery novel Force and Fraud (1865) and cost publishers nothing to enter. This year the Davitts are again sponsored by Swinburne University of Technology. The judging panel for 2018 comprises Age literary columnist Jane Sullivan, YA expert Danielle Binks, forensic specialist Debbie Stephen, Sisters in Crime convenors Michaela Lobb and Pauline Meaney, and former convenor, librarian Jacqui Horwood. Sisters in Crime Australia was set up 27 years ago, has chapters in several states, and holds regular events in Melbourne dissecting crime fiction on the page and screen. It also hosts a popular annual short story competition, the Scarlet Stiletto Awards. A short list will be announced in early July. See below for the long list.